I doubt anyone else ever made a movie as sad, as tragic, as despairing of the human condition, and yet so beautiful as Akira Kurosawa’s Ran. To give yourself over to it is to experience, in your gut, that many people are capable of unspeakable evil, that these people tend to come out on top, and that while these people inevitably pay the price for their ambitions, so do countless innocents. And kindness and charity—those all-important themes from Kurosawa’s classic period—are futile. I first saw Ran when it opened in Bay Area theaters in 1985 or 86. I don’t know how many times I’ve seen it, since. I own the DVD. Yet when I watched a beautiful new print at the Pacific Film Archive last night (part of its mammoth Akira Kurosawa Centennial series), I felt like I was watching it for the first time. I attending the screening, of course, as part of my project to see all of Kurosawa’s films in the order he made them. Like it’s predecessor, Kagemusha, Ran is a big, expensive, visually stunning epic, filled with pageantry, action (considerably more than Kagemusha), gruesome violence, and some of the most beautiful images ever caught on film. But unlike Kagemusha, Ran makes you care about the people in its story—even the ones (and there are plenty) guilty of horrific crimes. Although Kurosawa changed the heirs’ genders, he echos Lear’s daughters in the warlord’s daughters-in-law. His eldest son’s wife is as evil as Goneril and Regan put together (with Lady Macbeth thrown in), and makes for one of the greatest villainesses ever. The middle son’s wife, a religious Buddhist, is as loving and forgiving as Cordelia, despite having considerably more to forgive. Both wives come from families that were slaughtered by the now-retiring warlord back when he wasn’t looking for retirement, but for ways to conquer and massacre his neighbors. Here Kurosawa truly transcends Shakespeare. We’re told nothing about how Lear ruled Britain; his tragic flaw is simply an old man’s weakness for flattery. But Nakadai’s warlord has a history of aggression and deceit so cruel that even the evil daughter-in-law’s actions seem understandable if not justified. Before the film is over, the Lear character will come face-to-face with his horrible past in a devastating realization. 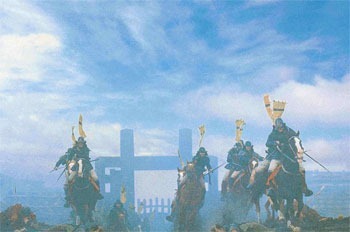 Midway through Ran, Kurosawa gives us one of the biggest, most powerful battle scenes ever filmed. Massive in scale and shocking in its brutality, it is neither fun, suspenseful, nor exciting. But its images–including one of a soldier, in shock, holding his severed arm with the one still attached to his body–are not easy to forget. Kurosawa’s humanism, which disappeared in Kagemusha, comes back full-force with Ran. But it’s the humanism of despair. People suffer, and whether they deserve it or not, we must share their pain and extend our empathy. But nothing—nothing at all—can relieve that suffering. Akira Kurosawa in 75 years old when Ran opened. It was only his fourth film in 20 years. One can’t help wondering if the experience of those years—rejection from the Japanese film industry he’d once conquered, spending more time trying to raise money and less making films—effected his world view. Like Lear, he’d lost what he had once ruled. Ran was his last epic, his last big-budget film, and his last samurai movie set in pre-modern Japan. In my opinion, and in many others’, it was also his last masterpiece. He would make three other films, but they would be modest works in budget, ambition, and quality. Note: This post was corrected on 9/7/10. My thanks to Art Rothstein for pointing out that I had misspelled Kagemusha.